Since MommyMatter started, we’ve always tried to write reviews on the places we shop at and offer discounts whenever they are available. There is one online shopping company that has quickly caught our attention that we’ve been talking about a lot lately on our social media pages, Well.ca. We’ve yet to do a review on them and thought, alright we’ve already submitted over 6 orders, it is time. So let’s begin with our brutally honest and oh so awesome review on Well.ca! 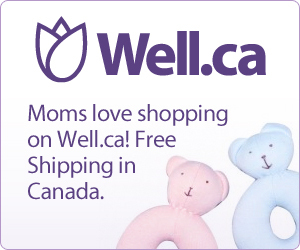 Instantly, we were very pleased with Well.ca. Navigating their website was easy peasy, no confusion and no bumps along the way. We of course searched around before we submitted our first order to get the feel of how things were, and have yet to find a bad review on their online store. Well.ca provides a huge selection of products at reasonable prices. We did some price comparisons to see if we were paying more then what we’d pay in store, and were greatly surprised to see that no, we weren’t paying more, we were actually saving. The huge benefit of it all, we were saving on the products and receiving free shipping because we are shipping in Canada! So that alone was a huge win win. Upon first order, we received an email stating that our order was received, then another email informing us that the order was being processed, then another email when the order was shipping! That alone, was shocking. They literally keep you in the know, until it reaches your door. The shipping is speedy. Usually we will receive the email that the order is shipped, and we receive the orders the next day. That alone, was awesome. The overall process from order to ship is usually 3-4 days. We’ve lucked out and had orders only take 2 days to process and ship. It seems to depend on the amount you order, and what the products are. We’ve submitted over 6 orders now, and everything is very quick to arrive at our doors. To our amazement, Well.ca packages their products for shipping amazingly. If you have liquid items in your order, they will not only have tape over where the opening is, just in case, but they will also be placed in their own individual zip lock bag so if they do break open nothing else gets destroyed. A++ for that one. The internal packaging is also all 100% recyclable! No more of that pesky styrofoam that seems to be impossible to get rid of! If something is breakable, they wrap the item up in bubble wrap, recyclable bubble wrap at that. Overall, the shipping packaging is the best we’ve experienced yet. From the day you submit your order to the day you receive your order, it is fast. Never more then a week. If you submit on a Monday, you’ll likely receive on the Friday, and if you are lucky the Thursday. They definitely got it together over at the processing factory. The pricing seems to always be a little cheaper then what you’d get in store. They also offer daily deals and weekly sales, so the likelihood is you can save on the products you order all the time. The biggest benefit, you are not spending any money on shipping, and you are not spending any money on gas to get to the store. A double saver right there! Well.ca really lives up to their guarantees. They offer an online store that does everything it can to keep its customers happy. We’ve become huge Well.ca buyers since we were introduced to them. If we can buy it online, we do. We no longer go to the store to get the items when we could save by purchasing online. The product selection is huge, and for someone who doesn’t drive, the convenience is perfect. 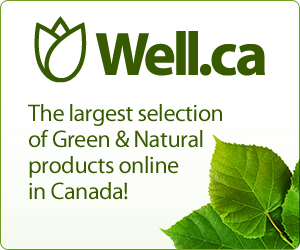 If you are considering shopping at Well.ca, do not hesitate! We love them to the point we feature all the Well.ca Coupons each week so you can save and fall in love with this company too!